The state has called for safety refresher training on 200 road projects, following two construction accidents at the Highway 520 bridge. Road builders across the state will pause from their work to receive extra safety training, in the aftermath of a near-disaster Tuesday night on the Highway 520 bridge. 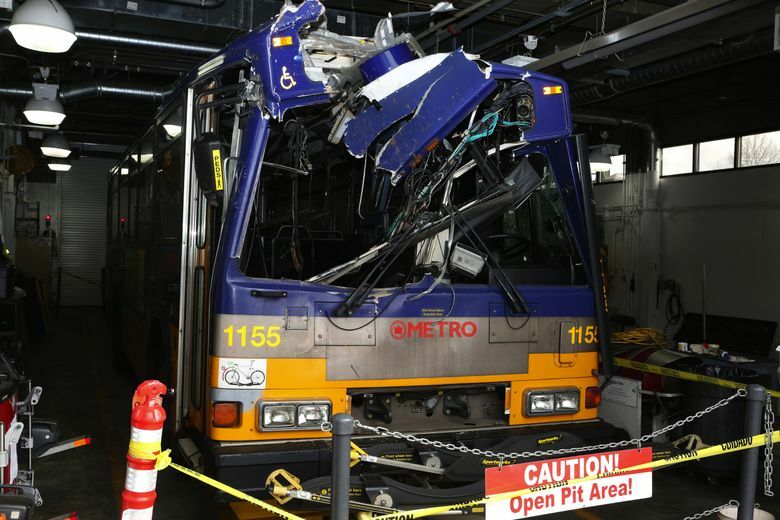 A load of steel pipe, being lifted by a crane from a parked truck, swung out of control — hitting a westbound transit bus, then an overhead sign, which toppled onto the bus, near Lake Washington Boulevard East on the Seattle side. The bus driver and seven of the 15 passengers, on King County Metro Route 271, suffered minor injuries. It was the third high-profile injury accident on the $4.5 billion project to build a new six-lane 520 bridge. Last week, carpenter Joseph Arrants, of Burien, died after falling 60 feet off the edge of the new bridge’s eastern high rise. Last year, a bridge worker suffered leg injuries while falling within a new pontoon, on the lake. Transportation Secretary Lynn Peterson on Wednesday afternoon called for safety refresher sessions on all 200 projects, to be held during the next month. These might take two hours on a megaproject, or less time on a small rural bridge, said Lars Erickson, spokesman for the Washington State Department of Transportation (WSDOT). Peterson also announced that John Milton, the agency’s top risk manager, will take a new job as director of quality assurance and safety. State engineers will perform walk-throughs and document inspections on all projects, she said. Tuesday’s pipe incident happened under lead contractor Flatiron Corp., which is building a $200 million segmentfor the future westbound lanes near the Seattle shore. Flatiron and senior state engineers met Wednesday to discuss what happened, and to consider whether to change work methods. In a joint statement, Flatiron and WSDOT said the nighttime pipe delivery has been performed safely many times since October. One apparent option would be to quit lifting pipe next to moving traffic — and reserve that job for two-lane or full bridge closures, which happen frequently on weekends. State and company spokespeople said it’s too early to comment about that. On Tuesday night the right westbound lane was closed, so a semi truck could deliver pipe for a subcontractor. The 120-foot-long pipes are being planted as vertical columns in the lake bottom, so a temporary work bridge can be built for contractor use. A crane on the work bridge was lifting pipe off the parked truck, while one general-traffic lane flowed a few feet away. “(The pipe) swung over, hit the bus, ricocheted off the top of the bus and hit the sign, causing the sign to fall on the bus,” said Trooper Chris Webb of the Washington State Patrol. Sonny Behrends, of Kirkland, who was driving east on the bridge when the accident occurred, said he stopped and heard people yelling for help. The bus driver, Jeffery O’Neill, calmly rose from his damaged seat and helped guide passengers out of the smashed vehicle, whose lights had been knocked out, said King County Executive Dow Constantine in a public message of thanks. A state project spokesman, Ian Sterling, said contractors will be held responsible, and will pay for replacing the sign. “They’re not supposed to swing across a live lane of traffic. That was never supposed to happen,” he said. All activities related to piling installation and pile driving were suspended at least a day, Sterling said. “We’re just thankful that nobody was seriously hurt, which was miraculous. It had the potential to be much worse,” he said. Mike Lindblom: 206-515-5631 or mlindblom@seattletimes.com. Twitter @mikelindblom.